This religion was founded about 4,000 years ago, around the year 2000 BC (Before Christ), or 2000 BCE (Before the Christian Era). The founder was Abraham, or Abram. Then the Lord told Abram, ..."I will cause you to become the father of a great nation. I will bless you and make you famous, and I will make you a blessing to others." And then the Lord went on to say that not only would this nation (Israel) be blessed, but the other nations and peoples of the earth would be blessed through Abram's descendants as they follow God, and influence those with whom they came in contact.... "All the families of the earth will be blessed through you." The world at this time was in pretty miserable shape. Most communities were corrupt societies known for their "great wickedness and immorality." Humankind became more and more separated from God, so God chose one man to begin anew. Therefore, in God's plan, Abraham became the father of this nation, and they are the "chosen people;" meaning, God made a covenant with the Hebrew people that they will be His people to bring all the nations of the world to Him. God's will is found most clearly in the Ten Commandments. At its core, the Tanakh is an account of the Israelites' relationship with God from their earliest history until the building of the Second Temple [c. 535 BC]. This relationship is often a contentious one, as the Israelites struggle with their faith in God, and attraction to other gods. Among the larger-than-life figures we meet in the Bible are the Patriarchs - Abraham, Isaac and Jacob, who wrestled with their beliefs -- and Moses, who led the Israelites out of Egypt and wrote many sections of the Old Testament. The Israelites gathered at Mount Sinai in 1313 BC [Jewish Year 2448 (the Jewish calendar is based on the generations of the Bible from Adam)] and received the Torah - the five books of Moses: Genesis, Exodus, Leviticus, Numbers, and Deuteronomy. These books, together with Nevi'im and Ketuvim are known as Torah Shebikhtav — literally the "Written Torah," as opposed to the Oral Torah, which refers to the Mishna and the Talmud. Before the events on MT. Sinai, somewhere between 1100 and 1300 BC the Egyptian pharaoh, fearful of the Hebrews' numbers, orders that all newborn Hebrew (Israelite) boys be thrown into the Nile. 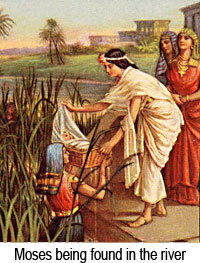 A Levite woman saves her baby by setting him adrift on the river in an ark of bulrushes. The pharaoh's daughter finds the child, and names him Moses, and brings him up as her own. But Moses is aware of his Hebrew origins, and one day, when grown, kills an Egyptian who is beating a Hebrew man, and has to flee into Midian, a place that is now part of Saudi Arabia. There he marries, and while herding the flocks of his father-in-law Jethro on Mount Horeb, encounters God in a burning bush. God reveals his name, Yahweh, to Moses, and tells him to return to Egypt and lead the Hebrews into Canaan, the land promised to Abraham. Moses returns to Egypt, and God instructs him to go to the pharaoh and inform him of God's demand that he let God's people go. Moses and his brother Aaron do so, but the pharaoh refuses. In retaliation God causes a series of plagues to strike Egypt, but the pharaoh still does not relent. God instructs Moses to institute the Passover sacrifice among the Hebrews, and kills all the firstborn children and livestock throughout Egypt. The pharaoh then finally relents and agrees to let the Hebrews go. Moses leads the the Israelites back to Canaan to Mount Sinai and this is called the Exodus which is also one of the books of the Old Testament. These along with the other books in the old testament were supposedly written by Moses, at least in part. A Synagogue can be formed if a town has 10 or more men, and serves as a school and meeting place as well as a place of worship. The Temple was a permanent place of worship, and the place where the people could atone for their sins - it was located in Jerusalem, only. Once the Israelites had settled in the land of Israel, the Tabernacle was planted in the city of Shiloh for over 300 years during which time God provided great men, and occasionally women, to rally the nation against attacking enemies, some of which were sent by God as a punishment for the sins of the people. This is described in the Book of Joshua and the Book of Judges. As time went on, the spiritual level of the nation declined to the point that God allowed the Philistines to capture the tabernacle in Shiloh. Once King David was established, he told the prophet Nathan that he would like to build a permanent Temple, and as a reward for his actions, God promised David that he would allow his son to build the temple, and the throne would never depart from his children (David himself was not allowed to build the temple because he had been involved in many wars, making it inappropriate for him to build a temple representing peace). 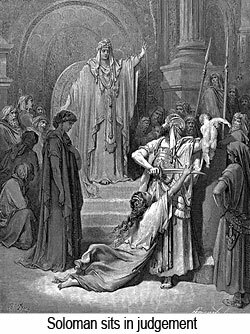 As a result, it was David's son Solomon who built the first permanent temple according to God's will, in Jerusalem, as described in the Books of Kings. The Western Wall in Jerusalem is a remnant of the wall encircling the Second Temple. The Temple Mount is the holiest site in Judaism. To the right you see the famous painting of King Solomon by Gustave Doré (1832-1883). Rabbinic tradition holds that the details and interpretation of the law, which are called the Oral Torah, or oral law, were originally an unwritten tradition based upon what God told Moses on Mount Sinai. However, as the persecutions of the Jews increased and the details were in danger of being forgotten, these oral laws were recorded by Rabbi Judah haNasi (Judah the Prince) in the Mishnah, redacted circa 200 AD (AD is Latin: Anno Domini; meaning, In The Year of the Lord), or 200 CE (the Christian Era). The Talmud was a compilation of both the Mishnah and the Gemara, rabbinic commentaries redacted over the next three centuries. The Gemara originated in two major centers of Jewish scholarship, Palestine and Babylonia. Correspondingly, two bodies of analysis developed, and two works of Talmud were created. The older compilation is called the Jerusalem Talmud. 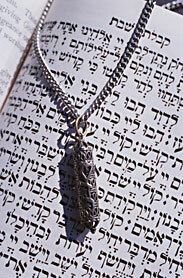 It was compiled sometime during the fourth century in Israel. The Babylonian Talmud was compiled from discussions in the houses of study by the scholars Ravina I, Ravina II, and Rav Ashi by 500 C.E., although it continued to be edited later. If you die tomorrow, are you going to go to Heaven? "Gee, I wish I knew ...." is the typical answer. Well, what do the major religions say? Judaism says there is a Heaven, and the way to Heaven is simply through faith in the Lord, and fulfill God's will. God's will is found most clearly in The 10 Commandments. Islam says there is a Paradise (Heaven), and the way to Paradise is to adhere to the teachings of the Koran, ardent devotion, and performing good deeds. Hinduism says that the goal is to achieve a "higher state of being" with Brahman (God), and the the way is through Reincarnation in a new body, and thereby, improving the Soul, to achieve Oneness with Brahman. Christianity says there is a Heaven, and the way to Heaven is to follow a fellow by the name of Jesus, his teachings and instructions, whom God sent down to planet Earth to help people understand. Buddhism says there is not a Heaven, and the goal is achieve the state of Nirvana, which is a condition, and not a place such as Heaven, or Paradise. The other isms (Humanism, Narcissism, Agnosticism, Monism, Atheism, and the like) all say it's a bunch of malarkey, a bunch of nonsense. This book gets to the core issues -- the key questions. You do not have to read the entire library to understand the differences! A Creator? Origin of Earth? Origin of humankind? Origin of evil and suffering? About reconciling with God? 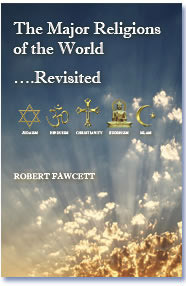 What is each religion's role, their purpose?